My son woke me up early this morning whispering the words that will make a grown man jump out of bed, "coyotes in the pasture!" I jumped out of bed, threw on some pants and a jacket, and headed for my safe. Out came my RRA 16" stainless-barreled 5.56 rifle. 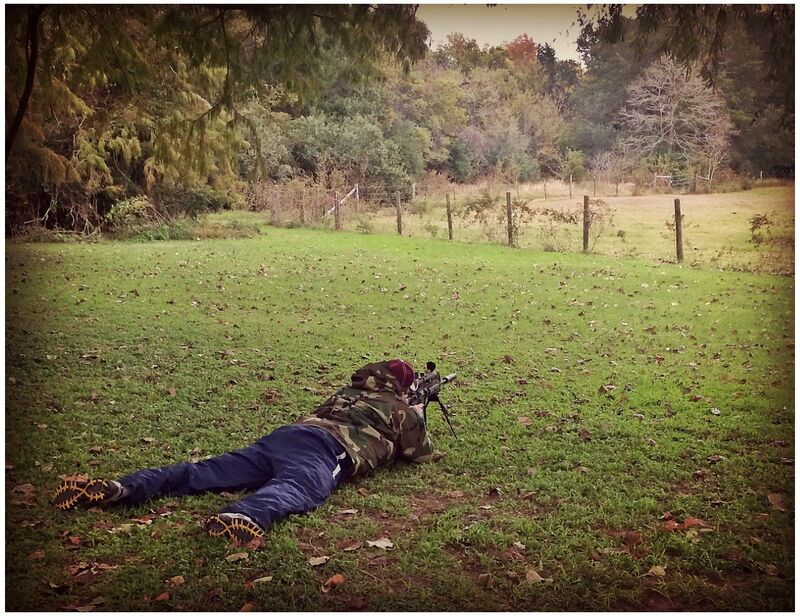 A few quick twists and my M4-2000 suppressor was mounted and I was on my way! I quickly charged the rifle walking towards the back of the house, press checked, tapped the forward assist, and closed the dust cover, as is my habit. I confirmed through the windows that indeed, there was still one big yote by the back fence-line, which put him 130 yards from my deck. Then I saw him duck into the tree-line. Dang! I went back to fetch my predator call, and decided to exit the house through the front door, so as to make less noise at the back of the house. I walked around to the back and proned out in the yard. My son thought I looked funny like this next to the hammock and tire swing, so he took this picture. I blew my call, but with my 2yr old crying, my dog barking, etc.., I couldn't get the yotes to come back. 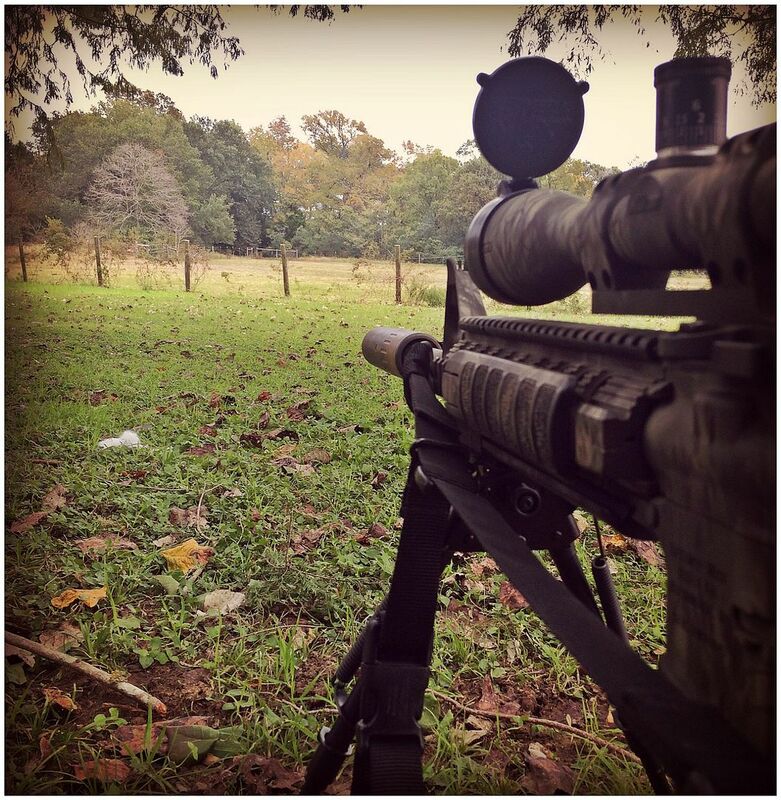 That didn't stop me from enjoying a little peace and quiet glassing my pasture. 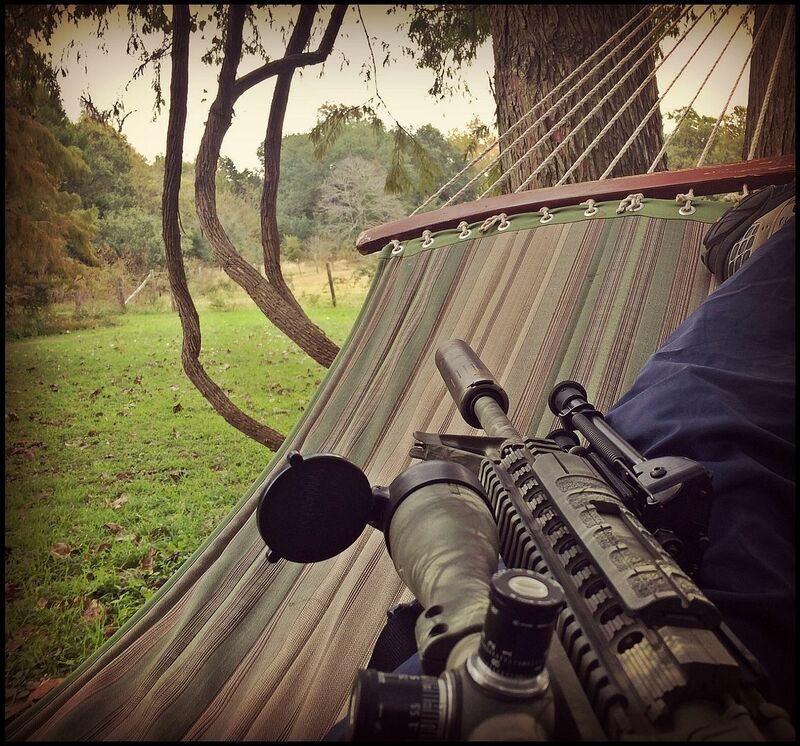 Eventually I made my way over to the hammock, for some 'relaxed' hunting. I'm so glad I moved out of the city! Yes, being out of the city is great!!! Dogs are kinda like ducks, you hang out for hours waiting for them to show and and when they do it is for five seconds and they are gone. Getting the gear out of the safe after sighting them very rarely works unless they are working a carcass. But, it is always good to be out of the city! I spend my money on dogs, hunting, racing, women, and whiskey - the rest I waste.